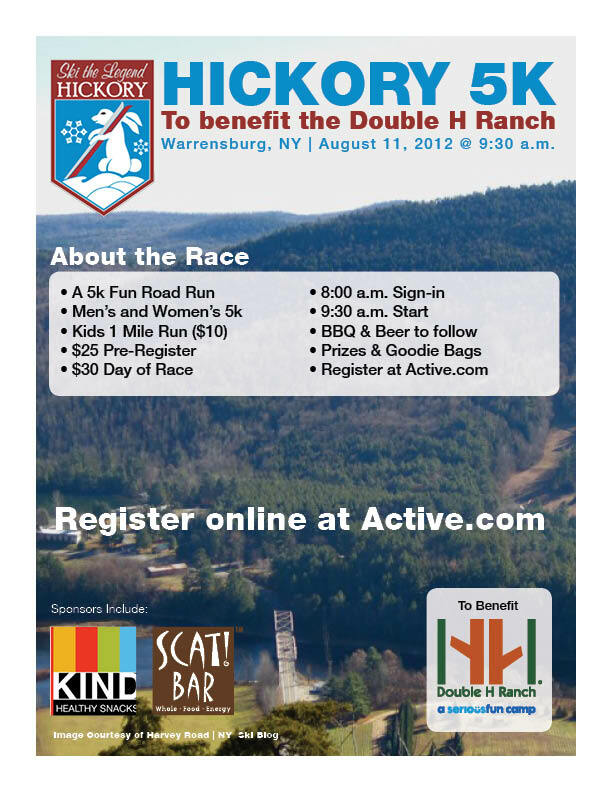 The first annual Hickory 5K race will be held Saturday, August 11 to benefit the Double H Ranch in Lake Luzerne and their Adaptive Winter Sports Program. Runners who preregister for the race save $5 and will be guaranteed a race t-shirt. Race packet pick up and day-of-race registration begins at 8am, with a 9:30 start. There will also be a one mile kids race. A post-race barbecue will feature food from the Stony Creek Inn and beer from the Adirondack Pub and Brewery in Lake George. 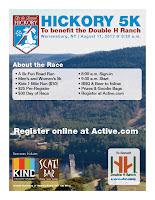 Prizes will be awarded for each age category, and all runners will receive 2-for-1 coupons good for skiing at Hickory this winter. 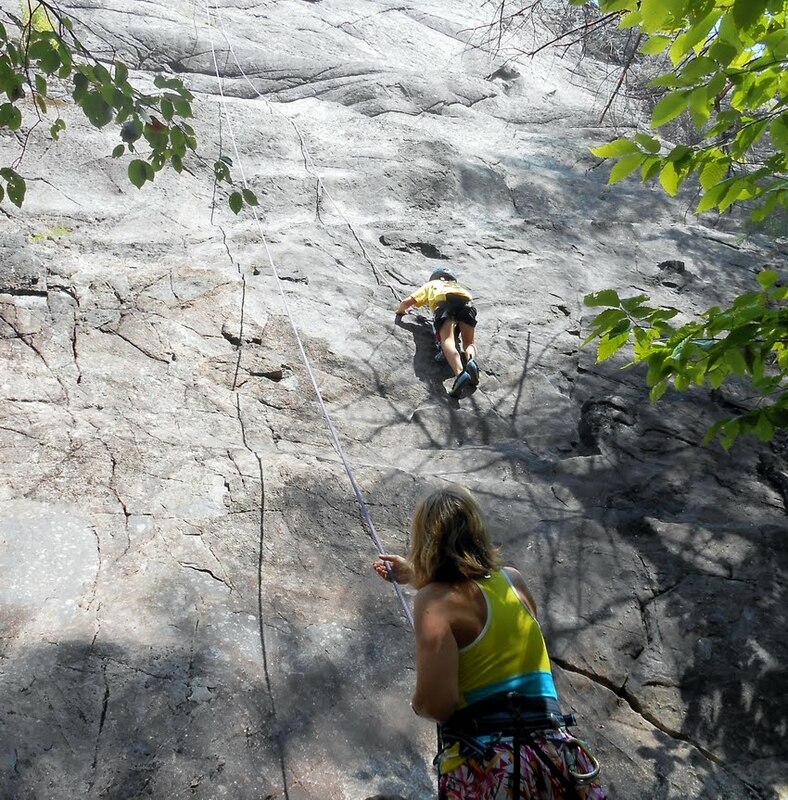 This past Sunday we headed up to King Phillip's Spring, near Keene Valley, to climb with our kids. With so many excellent crags in the Keene Valley area, KPS probably isn't at the top of anybody's list of favorite cliffs, but it's actually got a lot going for it: easy access (one minute from Exit 30), a short approach (10 minutes, allow 15-20 with kids), good toprope anchors (bring a static rope), and an open, flat base. Most importantly, the climbing at KPS is on coarse, clean rock at a laid-back angle, with numerous options in the 5.2 to 5.5 range. Perfect for an afternoon of family climbing. 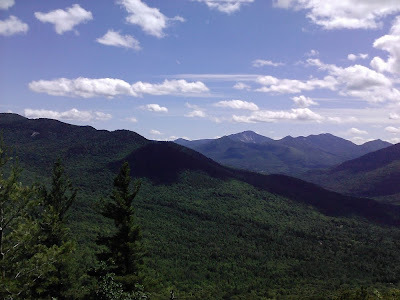 On Thursday, Beth and I hiked her final peaks for the Adirondack 46: Gray and Skylight. Lots of 46ers celebrate their final peak with a sign or a banner, celebratory beverage, maybe even a cake at the summit. Beth took things a step further, celebrating in her Saratoga track dress (the track opened on Friday) with champagne on the summit of Skylight. 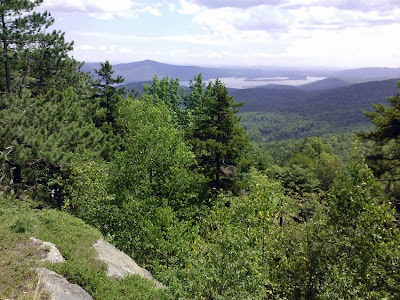 We opted to do the hike as a loop from Adirondack Loj, climbing via Lake Arnold and Feldspar Brook to Lake Tear of the Clouds, source of the Hudson River. From Lake Tear, both Gray and Skylight are short out-and-back climbs. Rather than re-trace our steps, we climbed up and over Mount Marcy, returning to the Loj via the Van Hoevenberg trail. This loop covers some of the most spectacular alpine terrain in the Adirondacks, a fitting final hike. 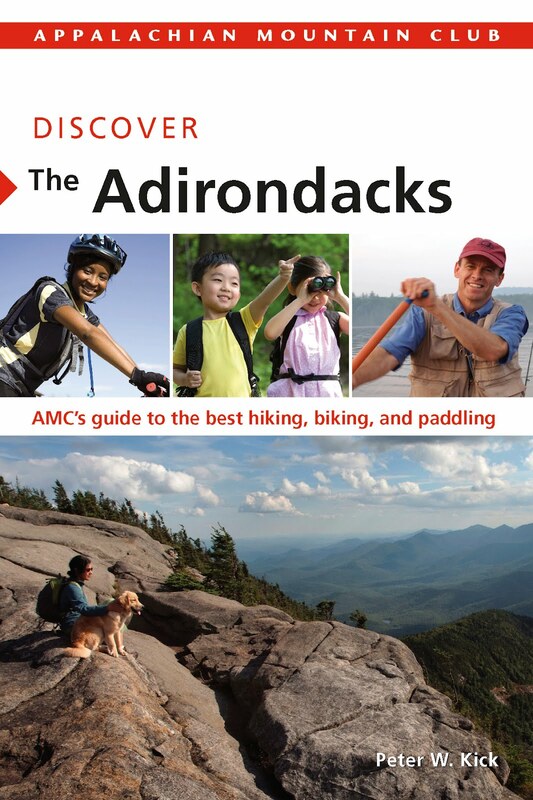 I recently received a review copy of the Appalachian Mountain Club’s new Discover the Adirondacks book, a guide to 50 of the best hikes, pedals and paddles in the Adirondacks. Targeted primarily at readers who are becoming acquainted with the outdoor recreational opportunities of the Adirondacks, Discover’s author, Peter Kick, has done a fine job of selecting some of the best – albeit most popular – adventures. Any such “best of” list is subjective by nature, and while one might quibble over which hikes or paddles made the cut (c’mon, no Blue Ledges? 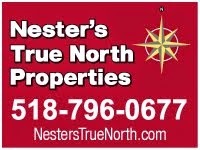 Why not Haystack instead of Marcy? ), the outings selected for the book represent an excellent sampling of the range of the opportunities available within the Park. Baxter Mountain seems to be near the top of everyone’s list of best short hikes in the Adirondacks, yet somehow I had always passed it by. On Sunday, while Beth climbed Nippletop (#44 towards her 46), I finally decided I should hike it with the kids. It’s easy to see why Baxter is so popular. A well-maintained trail switchbacks up the mountain at a moderate grade, leading to a series of summit ledges with stunning views of the High Peaks. 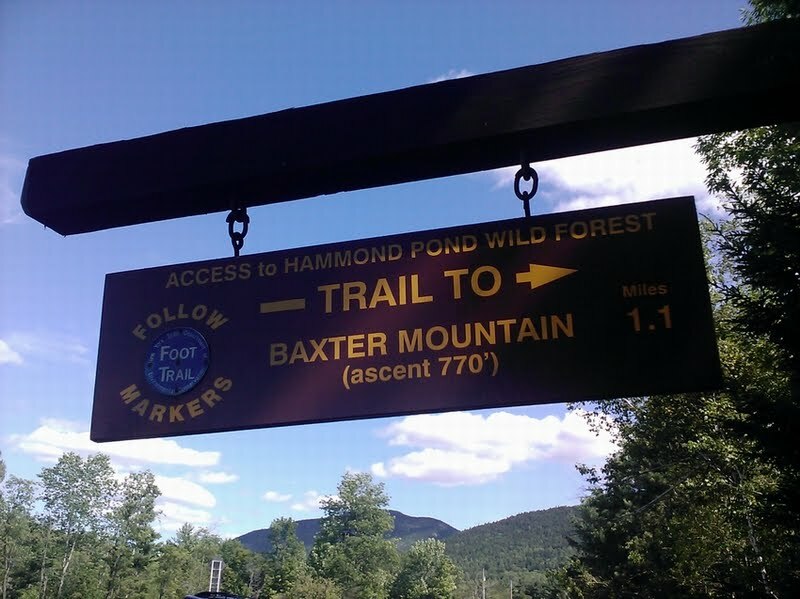 At 1.1 miles each way and a vertical climb of 770 feet, the round trip can easily be completed in 2 to 3 hours with plenty of time to linger at the summit ledges to enjoy the views. It's easy enough that Sylvie did the entire hike on her own - no carrying. Just don’t expect to have the trail to yourself: we saw 8 or 10 other parties on Sunday, with hikers ranging from around Sylvie’s age (4 and a half) to senior citizen. 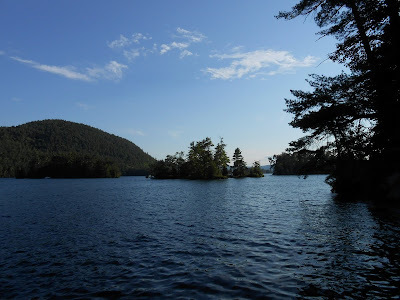 I've been boating and paddling around Lake George for more than 30 years, but I never grow tired of visiting The Narrows, the island-studded middle section of the Lake. 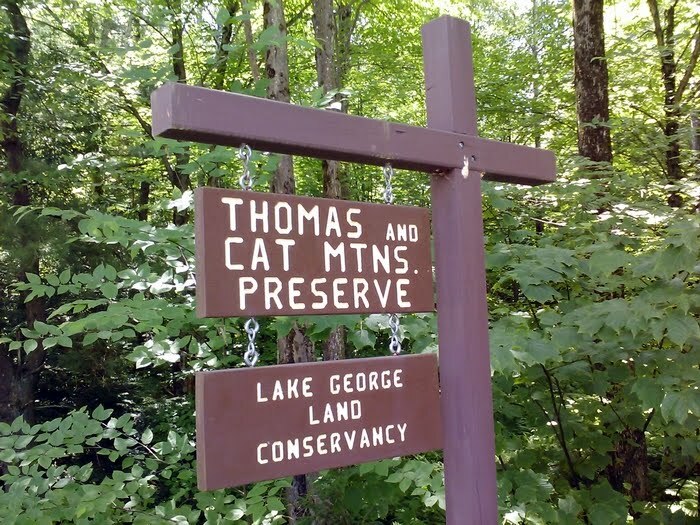 Steep mountains frame the Lake, and the forests on both shores are protected from development under the Forever Wild clause of the State Constitution. Many of the islands are available for camping, with a dock, picnic table and fireplace at each site. On Thursday, six of us (Beth, Daniel and me, plus 3 other family members) loaded up my parents' pontoon boat with tents, sleeping bags, a pair of kayaks and enough food for a week, even though we were camping for just one night. Sunday’s hike up Thomas Mountain at the Lake George Land Conservancy’s Cat and Thomas Mountains Preserve represented “another” Thomas Mountain hike not just because we return to hike there every summer, but also because another route up the mountain has been added to the preserve’s trail network. The as yet unnamed trail, referred to simply as the “new blue trail” on the preserve’s brochure and map, climbs at a moderate grade (approximately 500’ vertical in 0.8 miles) through a mixed hardwood forest to open ledges on the western slope of the mountain with views of the Schroon River valley and peaks of the southern Adirondacks beyond. 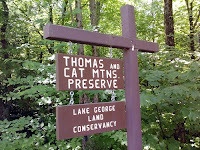 The trail then continues through the attractive pine forest along the ridge top to Thomas Mountain’s summit. Lake George's southern basin from the summit of Thomas Mtn.